Build week two in our athlete programs is always a tough one. Keep up the great work team, the effort will pay off come race season. Run Time Trials last week showed some big movers early, and solid results all round. Remember to use your time trials to calculate your training run paces and effort levels. Details on this can be found by logging into the members area and click on ‘Program-training’ (not online training). If you are having trouble finding this, let us know as this is important to develop and progress your running. Run time trial results will be updated after we complete swim and bike TT’s next week. This weekend we have our second camp for the year – designed specifically for Advanced Athletes and our Team of athletes heading to Las Vegas Half Ironman World Champs, London Age Group World Champs and Hawaii Ironman World Championships. The calibre of athletes attending this camp is right up there and they are set for a big weekend ahead. Coaches Ollie, Sarah, Ryan and Greg will be at the camp, sessions in Melbourne are still on – just read below for times and locations. Next week is recovery week – and it will be well earned! We also have swim and bike Time Trials. So make sure you freshen up early in the week to hit your Time Trials Mid-to late next week. Details on Swim time trials outlined below, Bike time trial information will be posted next week. Tuesday 6.00am – Beginner Swim Time Trials. This is for anyone who swims Tuesday Morning, AND/OR in lane 9 on a Wednesday Night. Wednesday 6.00am – Top Intermediate. Everyone else who swims middle lane or front of lane 9 on Wednesday morning. Wednesday 7.30pm – Low intermediate. Those who swim lanes 7&8 on Wednesday Night, or lowest of Wednesday Morning. Friday 6.00am – endurance recovery swim or sleep in. *If you are unsure of which Swim TT to attend please contact the office on 9645 2223. Swim time trial results from last round can be found online by logging into the members area here under ‘Programs-Training’ (not online programs) names TIME TRIAL RESULTS 2013. NEW SESSIONS ON OUR TRAINING TIMETABLE! Monday 6.30PM Run session at The Tan. (starts Mond 12 Aug) This is aimed at anyone who swims Tuesday mornings, can’t attend morning run sessions, or have more of a run focus with their training. Perfect session to hit straight after work! Tuesday 6.15PM Windtrainer session will be starting in the West. You have asked for it, and we are delivering it! Perfect for those that live/work in the CBD/North/West area and can’t get to MSAC. Small group will ensure you get plenty of one-on-one coach time, so make sure you get along to this session. We are just finalising details, but aiming to commence on Tuesday 13 August so stay tuned!! RUN TECHNIQUE PROGRAM – Starting this Sunday! If running is your weakness, or Coaches are constantly at you about improving your technique – then this program is for you! Click here – only 4 places remain! SPORTS PSYCHOLOGY SEMINAR, MENTAL TOUGHNESS: 6.30pm Monday 6 August. Learn from our Partners The Performance and Psychology Clinic (PSPC) – the experts in the industry on improving and developing your mental toughness. As they say – a race can be run or won on mental toughness. So why wouldn’t you want to train this area! Click here to read more and to RSVP. Well worth attending! DUATHLON RACE 2: Sunday 18 August, Richmond Boulevard. We recommend all Short Course athlete to use this as a training run for their pre-season. Click here for more details. deCASTELLA RUN & ATHLETE BBQ: Sunday 25 August. Click here for details and to RSVP. And don’t forget if you enter before this Sunday you will go in the draw to WIN a FREE pair of Mizuno’s! PRE SEASON TRAINING CAMP: 13-15 September. Over 50% Full and will sell out! Early Bird Special closes TODAY! Click here for more details. LAST CHANCE – WIN MIZUNO RUNNERS! Tri Alliance will be supporting a fantastic run event – the De Castella Run on Sunday 25 August. The event is held at Kew Boulevard and includes a 5km, 10km and 15km event. Simply by entering THIS Friday 2 August we will put you in the draw to WIN a pair of shoes from our fantastic partners MIZUNO! Early bird price only $40! And we’ll be holding an athlete BBQ post event, so make sure you put this one in your calendar. Click here for more on the event and to enter. Once entered, please email [email protected] your confirmation to go in the draw to win! GATORADE / ACTIVE FEET SERIES NOW OPEN! This discount applies for all events – so make sure you check out SuperSprints Website and get involved! Get your hands on a Super Fast, Super Slick Time Trial Machine ! This matt black 2012 Giant Trinity SLO has had 1 season of racing Ironman and is ready for a new owner. Regularly serviced and will be handed over with a free service and FREE Retul Bike Bike to ensure you are ready for fast riding. Suitable for an rider between 5’10 and 6’2. Click here to read more on this bike. 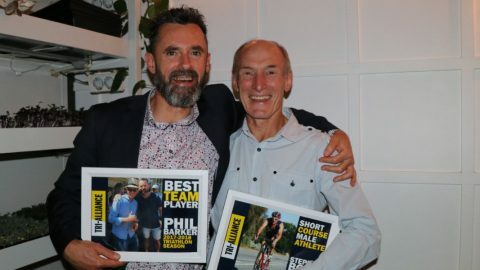 So if you are in the market for a Time Trial Bike this season, contact [email protected] or phone 0425 731 036. Meet: North Point Cafe, Brighton. Plenty of off street parking. Time: 7.10, for a 7.15am start. Meet: Melbourne Sports & Aquatic Centre, inside main entrance. Time: 7.50am for briefing. Run will start immediately after briefing. Distance/s: Will vary based on level. Full details will be provided. Post Run Coffee: Albert Park Area. 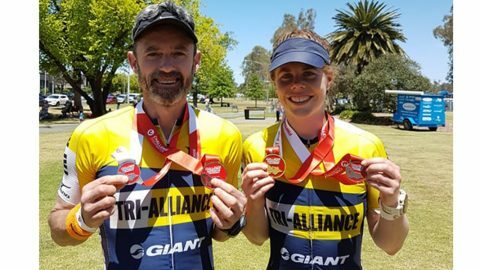 Contact Tri Alliance if you are looking for beginner triathlon programs, online triathlon training programs or you are training for an Ironman.